In episode three, Ray Mears explores a quintessential British habitat – the hay meadow. He travels to the Mendip hills in Somerset, where nearly half of Britain’s hay meadows and unimproved grasslands can be found filled with a beautiful and diverse mix of wild-flowers and grasses. This rural idyll is at its best in the height of summer when birds, rabbits, butterflies and badgers are enjoying the plentiful food supply. It was once a common feature of our countryside but the meadow is sadly now a rare habitat. Ray’s first stop is Chancellor’s Farm, a nature reserve run by the Somerset Wildlife trust just north of Priddy. The sun is out and the air is filled with sound of summer, the song of the skylark and the buzz of bees busy pollinating the wildflowers. Ray discovers a few of his favourite meadow plants including meadow sweet, red clover and the ‘yellow rattle’. He then meets Dr Pippa Raynor from the Bumblebee Conservation trust. Dr Raynor has studied wildflower meadows for seven years in order to conserve the bees that populate them. She explains how the mutual relationship between the bumble bees and flowers works. The bees need the flowers for the pollen they collect and, in turn, the plants rely on the bees to pollinate them as they bumble from flower to flower. Ray goes in search of the Green Woodpecker and reveals that the secret to finding almost any species in the wild is finding the right habitat. Knowing that the woodpeckers need an abundant supply of insects, he settles down patiently near some anthills and is soon rewarded with a sighting of some junior woodpeckers and a male adult. Ray then meets butterfly expert Matthew Oates from the National Trust. Matthew explains that we have just 59 species of butterfly that are resident here in Britain. With Matthew, Ray spots meadow browns, a small tortoiseshell and a large skipper. The hay meadow is a clear example of how a habitat and the creatures that live there rely on each other to thrive. But this precious habitat is one we’re in real danger of losing. Since the Second World War, farming practices have changed hugely. Intense farming and the use of herbicides destroy many of the wild flowers and grasses that provide vital food and shelter for meadow wildlife. Sadly, 97% of the meadows present in the 1940’s have now disappeared. At Chancellor’s Farm, the meadows are traditionally managed. Devon cattle are used to graze the pastures and control the growth of coarse grass and scrub which could quickly dominate the various wildflowers and grasses. The cows also help the diversity of the flowers by spreading the seeds as they move from field to field. As evening falls, Ray heads to a local barn where he hopes to see one of our best-loved and most magical birds – the Barn owl. The owls tend to nest in manmade structures near to open countryside where there is a good supply of food. He is in luck. A barn owl has made its nest inside the barn and treats Ray to a spectacular display as it swoops into the field and returns with a vole. Fantastic! I never tire of that. They are just amazing! If ever there was a reason to still have our hay meadows and rough pasture, it has to be the barn owl. 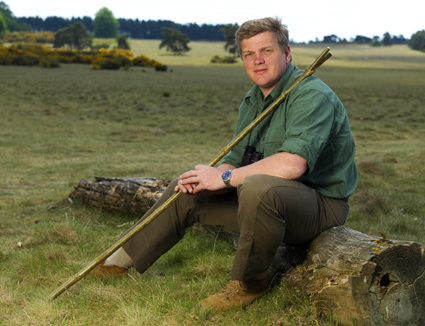 This entry was posted in Ray Mears on October 21, 2010 by Woodlore Team.